As our Haiti Team returned this year, the leadership of our Haiti Partnership has been blessed and encouraged by their reports. We were also encouraged to receive a request from the team members to share more of their personal experiences through the blog. For the next several weeks, we will post reflections from each team member regarding a specific experience they went through. Some of these posts may be a little longer than the posts we received from the team during their time in Haiti, but we encourage you to take time to read and engage with the exciting news remembering that each one of us can have an active role in our Haiti Partnership through our prayers, our praise to God, and our continued support and interest in God’s active work through the church in Gens de Nantes. I continued to learn that prayer is powerful and God is a faithful, miracle working God. God has shown me that the seeds that have been planted and watered over the years are producing an abundant harvest for His Kingdom in and around Gens de Nantes. God also taught me the importance of friendship, encouragement and perseverance! 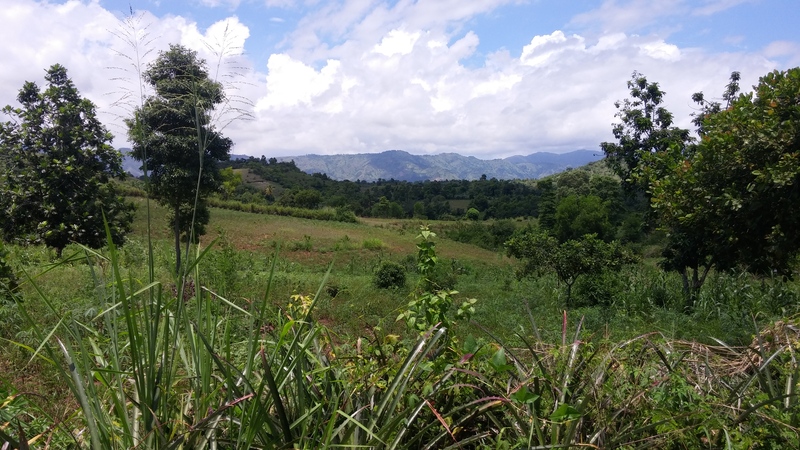 I didn’t worship at the Gens de Nantes (GdN) AEM church on Sunday morning as I had the opportunity and blessing to travel to Marionette, a small community up in the hills a half hour motorbike ride north-east of GdN. My morning in Marionette was one of the highlights of my trip to Haiti this year. Seeing God’s beautiful creation - the green hills and mountain vistas was awe-inspiring! However, the people of Marionette and the support and encouragement of the GdN AEM Church youth and young adults was even more awe-inspiring! The church in Marionette is relatively new. 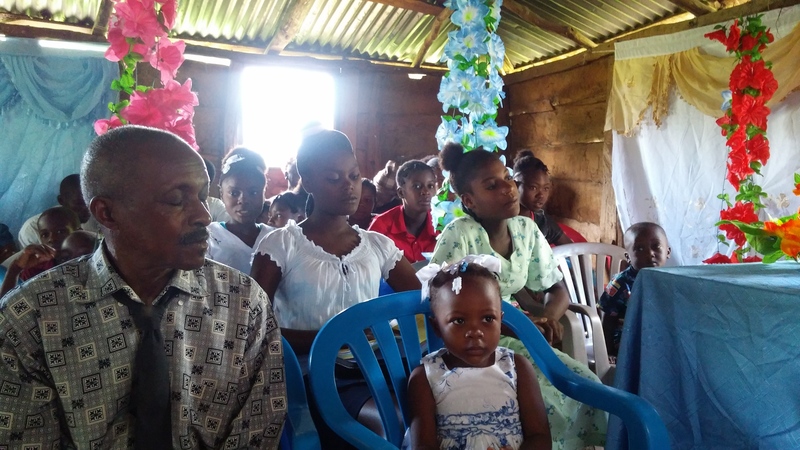 This small yet thriving congregation was started only 2 months ago by a man who came to Christ from watching The Jesus Film. There are now approximately 40 people who gather on Sunday mornings to learn, worship and pray together. They meet in and around a small wooden shack that can seat up to 30 people on rows of plastic chairs. Others gather outside and sit in the shade of a large mango tree. 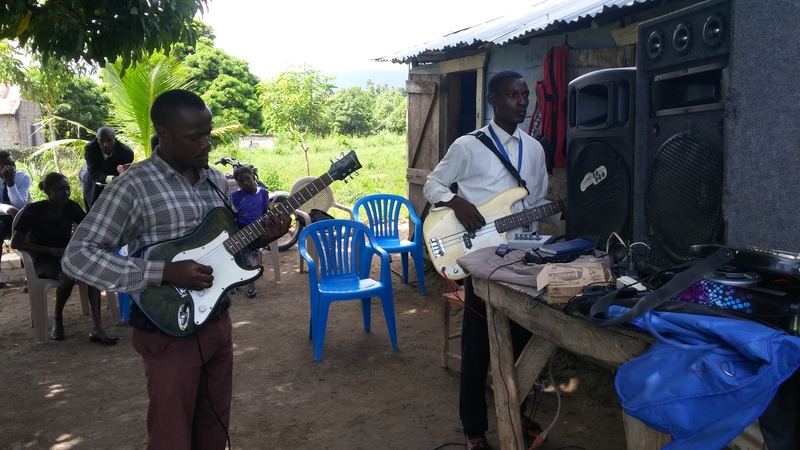 It was an encouragement and blessing to witness a group of young people from the GdN AEM church loaded down with sound equipment, guitars and a small generator on motorbikes travelling to Marionette to bless and encourage this new congregation. Each Sunday morning different groups of young people and lay leaders travel to Marionette to lead, serve, and bless this new church. They linger after the worship service to fellowship together and build relationships that will last for all eternity. 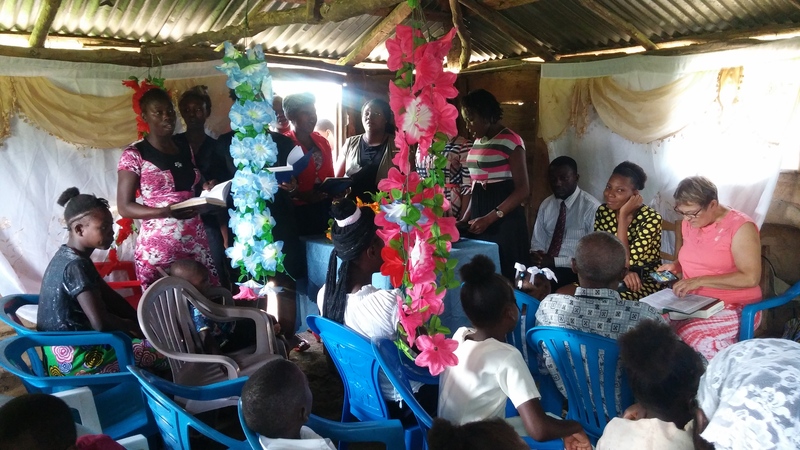 Just as we have gone out in faithful obedience to bless and serve the church in GdN, that congregation is now too going out, blessing and serving others. I was also encouraged to hear about the Marionette community prayer meetings. The week before they had 60 in attendance. This small congregation was challenged to double that number and hoped to see 120 people join to pray on the following Wednesday. We heard testimonies of the power of prayer - miraculous healings and God’s work in and around the community. One elderly gentleman had been afflicted by mental illness for many years, he has been healed after he met Jesus and is now fully alert and in his right mind. Another man who shared how he always knew there was a God, and recognized the creator by all the beauty he saw around him, yet his life was empty and unfulfilled. He had a gambling addiction, a very common problem in Haiti. After this man submitted his life to Jesus his addiction is completely gone! He now fills his time worshipping God and serving the church. He is praying that his extended family will also come to know the Lord in a real and personal way. The Scripture lesson that Sunday morning was based on 1Thessalonians 5:12-24, a good reminder to “Be joyful always; pray continuously; and give thanks in all circumstances”. We, along with our Haitian brothers and sisters, have much to be joyful about - even in the midst of troubles and heartache. We have much to pray about and be thankful for. The church in GdN and Marionette are alive and well. They are doing the work of discipleship - they are going out in faithful obedience witnessing, praying and doing the work of the church. God is being glorified and His Kingdom is coming as we pray! There is much we can learn from their faith and obedience - prayer is powerful, there is always hope, seeds that are planted are being watered and producing an abundant harvest – may I never forget my day and the lessons learned in Marionette! I’m so thankful for all the prayers and support we received during our time preparing and serving in Haiti. Please continue to pray for our brothers and sisters in Gens de Nantes and surrounding area and for our on-going partnership there. God is at work and lives are being changed!